We created this page to share programs we have written that might be of general interest. Since bartellonline.com is all about customization, most of the programs we write are for very specific situations. Hence, the offerings here are pretty slim. However, other users have found these programs helpful and we hope to expand the offerings as time goes on. These programs are offered for free and include no warranty of any kind. UNIX/Linux (and Windows under Cygwin) xword (1.4 M) xword is a helper for solving crossword puzzles. 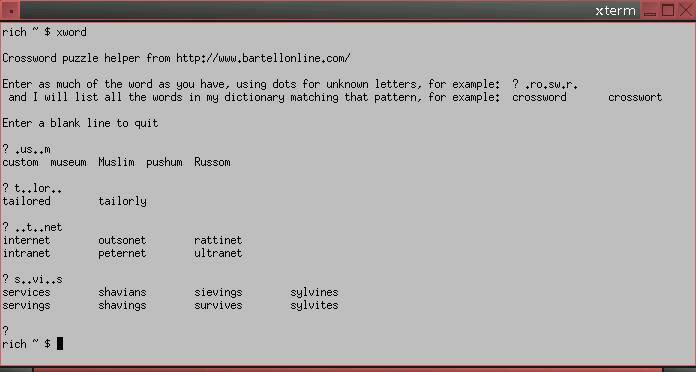 It is a command line program that allows you to enter as much of a word as you have figured out, using dots in place of the letters you don't know, then it lists all the words matching that pattern from a builtin list of words compiled from various sources. It is actually just a 19 line bash shell script tacked on top of a large compressed word list. The list is mostly English words but includes many worldwide geographic names, other proper names, and abbreviations as well. The program should work on most modern *NIX distributions that use the bash shell. To use it, just download the file, either make it executable ("chmod a+x xword") and run it or just type "bash xword", then follow the brief instructions. Those stuck with another operating system can try out xword online. Windows 95/98/2000/XP FileNameEditor.exe (318 K) FileNameEditor is a Windows GUI utility to assist in renaming files and is particularly handy for editing the names of large groups of related files, such as music or photo collections. It has an Explorer-like interface with a folder tree on the left, folder contents with editable names on the right, and options at the top for manipulating the file names in various ways such as search and replace. 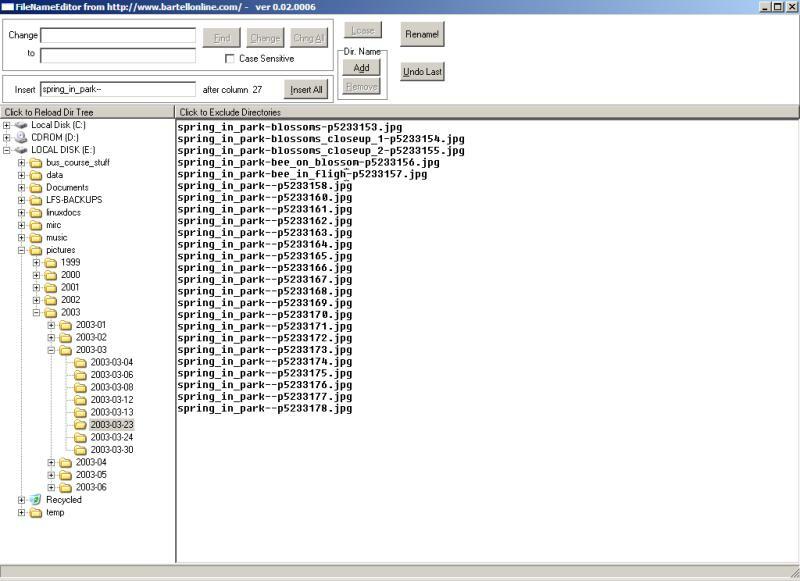 For most operations you can highlight a subset of the files and the operation will apply only to those files. There's no written documentation, but things should be pretty clear after a bit of experimentation, which is pretty safe since no files are actually renamed until you click the "Rename!" button. FileNameEditor was written using the Rapid-Q free BASIC compiler, which unfortunately is no longer being developed. Though we also stopped developing FileNameEditor quite awhile ago, a lot of people have said they still find it useful. No installation is necessary, just download the file and double click to run it.